Today was so close to being normal. I woke up and immediately stumbled to the coffee maker, not even bothering to rub the sleep from my eyes. The coffee maker was fickle as usual, but I still managed to get my coffee after finding a combination of coffee grounds and water that it found agreeable. To celebrate my victory over my early morning foe, I took my coffee to the window to gaze out at the landscape, and at first glance, everything seemed as it should be—except for this one strange blob that I couldn't quite focus on. At first, I ignored it. I mean, really, did it think my eyes weren't good enough to focus on it? How dare that shapeless mass look down on me like that. I didn't need that kind of attitude so early in the morning. But as soon as I was about to give up on it, the blur moved, causing it to break off from the background. Amidst the explosion of expletives and spit-out coffee, there was a moment of recognition of that the blur was. 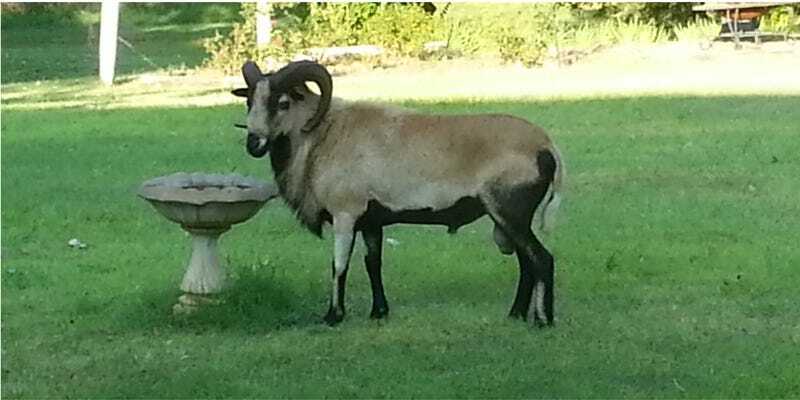 There was a ram in my back yard—a ram that was now dead set on using the bird bath as a drinking fountain. For a while, it was pretty cute. How often do you see a ram in your backyard? It was like having my own little petting zoo; you know, like those ones you never visit, but it's nice to know they're there. The cuteness kind of wore off thirty minutes later when it was still hanging around the bird bath, though, so I went out onto the porch and started to try to shoo it off. At first, it started to walk away, then it turned back towards me, stomped its hooves, and charged onto the porch. Needless to say, I ran back into the house at around the "hoof stomping" phase. After a few calls to the Sheriff's office and some neighbors, I found out that apparently someone was moving their livestock and one of them got loose. I left for the bank after making sure that the ram wasn't hanging around my car, and while I was gone, the owner eventually came over and picked it up by herding it back to his trailer with a four-wheeler. I kind of wish I got to see that. Oddly enough, he actually just came back now. I'm not entirely sure what to do about it, but I don't think Ein is getting much of a walk tonight. I'll probably be making more calls to the Sheriff's office, though. Sigh. As the title suggests, we're going to talk about odd stories tonight. Any weird stories you would like to share are welcome. They can even be gaming-related, like glitches or weird encounters in MMOs. Of course, if the topic did not interest you, feel free to talk about life, love, gaming, or whatever else you desire. The Wednesday Graveyard Shift is now open!